Ooooooh I have been busy and I'm back with a Freebie for you, coz I know how much you all like a Freebie! 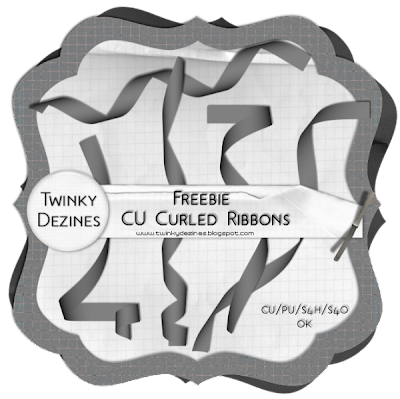 These are Curled Ribbons for all your scrapbooking needs. thanks for sharing these gorgeous ribbons! NEW CU Freebies Only Forum on Sunday July 26th 2009, in this topic: Ribbons & Bows Your Place to find Commercial Use Scrap Booking Freebies! Thanks for sharing these, they're great! Thanks, one always can use these, never enough! Thanks for sharing, ribbons and bows are not my strong point..lol. How awesome are these?! Thank you! !